The REPAIR-lab will use human in vitro systems to study the cellular effects of the nano-objects developed by the other partner laboratories. The use of complete cells represents the most complex of the in vitro models available in the consortium. The REPAIR-lab has human cell culture models of different complexity, beginning with permanent cell lines of varying tissue origin, including endothelial, epithelial and connective tissue cells. These are useful models for the rapid testing of possible cytotoxic effects. The next level are human primary and early passage cells. Examples are various types of endothelial cells (EC), especially from the microcirculation (skin, lung), osteoblasts, cells of the monocyte/macrophage lineage from peripheral blood. A further focus is adult progenitor cells, including outgrowth EC, basal cells from the upper respiratory tract and mesenchymal stem cells (MSC, bone marrow, adipose tissue). The most complex systems established are co-cultures. These include barrier models, which are of special interest for nanoparticle interaction with the human organism. Examples are the blood-brain barrier for access to the central nervous system and the air-blood barrier for access to the lung, and via the lung to the systemic circulation. Human upper airway epithelium differentiated from basal progenitor cells in co-culture with human lung fibroblasts. The red fluorescence represents the expression of ZO-1, a tight junction protein essential for barrier function. 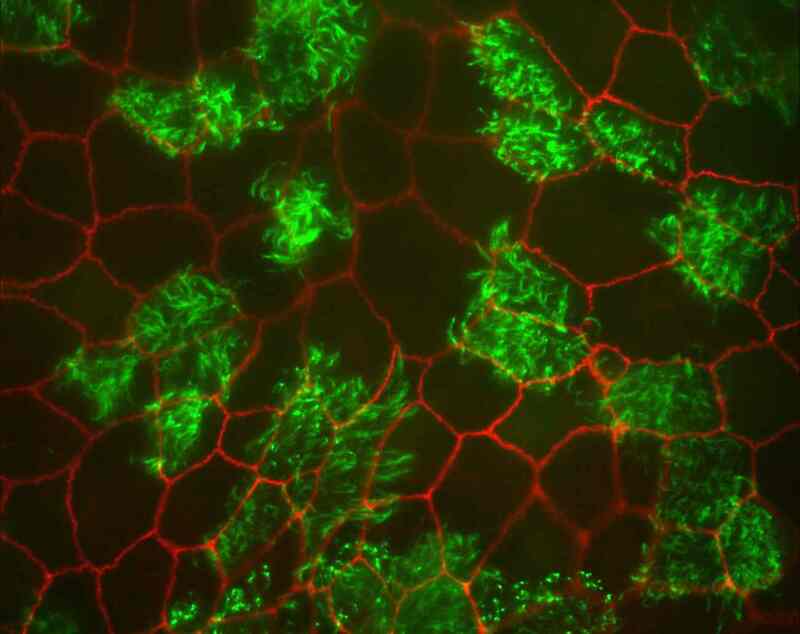 The green fluorescence is the expression of ß-tubulin in the cilia of the columnar respiratory epithelial cells. This cellular barrier model will be used to study nanoparticle interactions with the respiratory system. The functionality of these systems is tested by state-of-the-art cell and molecular biology. Thus, we are seeking PhD candidates with their primary training in cell biology or bioengineering with strong life science experience, especially in in vitro bench work. In addition to human cell culture techniques, confocal laser scanning microscopy and functional assays at protein and nucleic acid level are major methodologies used in the lab.